Glynis Astie: Meet My Main Character, Blog Hop! Meet My Main Character, Blog Hop! I have been tagged by the very talented Celia Kennedy, author of Venus Rising and Charlotte’s Restrained to take part in this blog hop about the main character in my latest work in progress. I recently finished reading Charlotte’s Restrained and thoroughly enjoyed the international adventure taken by Charlotte and her motley group of friends. I found it to be full of humor, heart and beautiful destinations. What’s not to love? My character’s name is Sydney Durand and in a word she is, well, me. The books in my French Twist series are based loosely on my real life French fairy tale. In the first book, French Twist, Sydney meets the gorgeous and talented Louis Durand and becomes his wife in a mere six months. 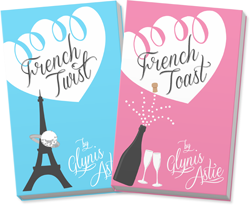 In the sequel, French Toast, Sydney and Louis struggle through their first year of marriage, while planning their second and third weddings. (You’re intrigued, aren’t you?) I am currently working on the third and final book in the series, in which Sydney and Louis encounter an unexpected turn of events. The story takes place in the San Francisco area, and though I do not specify dates, it is clear that the story takes place in modern times. Sydney and Louis have had a very tumultuous year. Louis was laid off from his job six months into their relationship, causing a hasty marriage to keep him in the country. Then they planned two weddings in two different countries in order to ensure everyone’s satisfaction (most importantly the bride’s). As they look forward to setting into a quiet life together, Sydney discovers that she is pregnant. From the moment that Sydney met Louis, her carefully planned life went out the window. Thankfully, she has come to realize that this doesn’t have to be a bad thing. Sydney’s goal when faced with impending motherhood is to figure out how to do it to the best of her ability. This will, no doubt, involve reading every book that she can get her hands on, interrogating every mother that she knows and trying her best not to freak out about the gargantuan upheaval that is about to take place in her life. The working title of the book is French Fry. I am afraid that I have been very busy with marketing lately and have only been able to write four chapters. I hope to make a lot more headway this summer! Thanks to the Chicklit Sisters, Pam Burk and Lorraine Campbell for tagging Celia, thereby allowing me to join this lovely blog hop! I am intrigued by the novels they have written together under the pen name, Ellie Campbell, and plan to add their works to my TBR list. To keep things going, I have tagged another very talented person, Kathryn R. Biel, author of Good Intentions (2014) and Hold Her Down (2014). You’ll find Kathryn’s blog at http://kathrynbiel.blogspot.com/ I highly recommend stopping by often for a dose of Biel Blather! For more information on my books, please visit this link.